If you’re looking for a Bay Rum shaving cream that isn’t overpowering but has a fantastic, fresh scent, Extro Bay Rum is perfect for you. With warm notes of Rum and spices, this scent is a classic and very masculine, however not quite as heavy as some of the more traditional Bay Rum fragrances. We describe it as young and fresh. This is a hybrid, it's between a slightly hard cream and a soft soap in its consistency. It lathers very easily into a rich, protective lather that is a sheer joy to use. Expect 5-6 months daily use from this product. 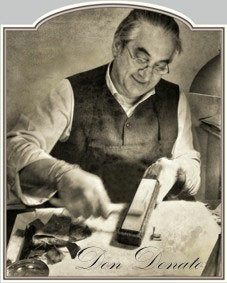 Extrò Cosmesi shaving creams are handmade by Donato Ciniello the old fashioned way, in Settimo, Torinese, Italy. Free of parabens and alcohol these artisan shaving creams include vegetable-based ingredients, making them ideal for sensitive skin sufferers. There is no better way to finish off your shave other than a splash of matching Extrò Cosmesi Bay Rum Aftershave. Extro Rum is very rich in its consistency when lathered up. The wide diameter glass jar is large enough for you to swirl your shaving brush in for luxurious face lathering. Absolutely marvellous, sensational in fact. I love the young, fresh, light yet mildly spicy scent and how easily the cream lathered up directly from the glass jar. A must-have shaving cream for the serious wet shaver. Aqua, Cocos Nucifera Oil, Stearic Acid, Sodium Idroxide, Macadamia Ternifolia Seed Oil, Hidroxid Elastin, Ubichinone, Parfum, Linalool, Eugenol, Limonene, Cinnamal.